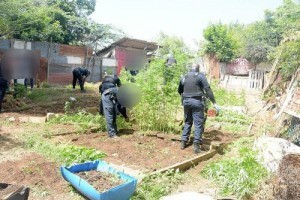 WILLEMSTAD - The police have dismantled a marijuana plantation yesterday. That happened behind a house in Groot Santa Martha. There were almost 1900 marijuana plants under the sun. The raid was related to a drug and arms trade investigation. A 21-year-old man was arrested.